Congratulations to all our Longford AC runners in the 2018 SSE Airtricity Dublin Marathon which also hosted the Athletics Ireland National Marathon Championship, many achieving new PBs on the day. Conditions were near perfect for marathon running; a cold day with no wind and it stayed bright and dry. Longford AC had a large contingent of runners participating this year and as the results show it was an incredibly successful day for our small club. Pride of place goes again to Adrianna Mulligan in the women’s race and Paddy Sharkey in the men’s race. Adrianna, running in the elite woman’s field, ran an incredible race to better her pb by over 5 minutes and come home in 2:52:20. Competition was hot at the front of the race this year, along with the international athletes that always compete in Dublin, the race also doubled as the European Police Championships resulting in extra quality upfront in both the men’s and women’s races. Adrianna came home a fantastic 14th woman overall and 5th Irish women in the National Championships. This achievement now sees Adrianna ranked 10th Irish woman over the marathon distance for 2018 on the Athletics Ireland Top 20 Performance list. Paddy Sharkey ran another great race to come home in a new pb of 2:37:51 and finish 85th overall and 9th man in the Over 40 category. Paddy has been clocking impressive results over the past few months. Since finishing 2nd in the Longford half marathon in August with a new pb at that distance, Paddy has also competed in the Berlin Marathon in September along with fellow Longford AC athlete Barry Sheil. Both ran impressive times in Berlin; Barry finishing in 2:33:29 and Paddy in 2:39:46. It was good to see Barry out on the course in Dublin at the 25th mile make supporting all the Longford runners. Paddy doesn’t rest on his laurels for long and is already planning his next marathon. Kevin Ward was next home for Longford AC with a new pb and great time of 2:47:25. Kevin finished 24th man in the Over 45 category. Following in behind Kevin was Donal Mulligan who came through strongly in the second half to pb in 2:54:49 and finish 39th man in the Over 45 category. Declan Newman who completed Ironman Sweden only a couple of months ago ran strongly to finish next not too far off his pb in 2:55:23 and inside the top 100 men in the Over 40 category. This made it five Longford AC runners inside the 3 hour barrier. Juraj Karcak was the next man home in 3:09:50. The 26.2 mile marathon must have felt like a short run for Juraj who regularly races in distances of over 100 miles. Niamh Kiernan running only her second marathon was the second Longford woman home with a super pb improving her time by more than 10 minutes when finishing in 3:09:52. This excellent time puts Niamh as the 60th woman overall, 19th woman in the Over 35 category and 26th woman in the National Championships. Colin Beades crossed the line just behind Niamh to hit his race goal and finish with a big new pb of 3:10:03. Sinead Phelan was Longford AC’s third woman home in a time of 3:17:53. Sinead was using Dublin in her build up to the New York Marathon which takes place next weekend and we all wish her well. Sean Crossan came home with a new pb of 3:19:58 only three weeks after completing Ironman Barcelona. We are waiting on his time but reports are that Enda Coffey also ran a fine marathon only three weeks after he also completed the Ironman Barcelona. Must be time for a well-deserved rest now lads. Derek O’Neill ran strongly to follow closely behind Sean in a time of 3:20:59. Ann Brady running her first marathon in 4 years had a super run to finish with a massive new pb in 3:31:38 and 63rd woman Over 35 category. Finishing close together in good times were Colman Reilly 3:34:03, Michael O’Hara 3:35:58 and Joseph Carolan 3:36:55. Sicino Dube was next home in 3:45:05 followed by Seamus Murtagh who was completing his 27th marathon in 3:48:28. Stephen Mc Dermott came home well under the 4 hour barrier in 3:50:15. Erin Barrett was back to her best, running strongly to finish inside the 4 hour mark in 3:58:19. Christiaan Snell hit the 4 hour mark on the head when finishing next in 4:00:54. Ray Brogan finished in a very good 85th position in the men’s Over 60 category when finishing in 4:13:50. New member Tom Quinn finished well in 4:16:09. Claire Wynne running her first marathon ran consistently to finish strongly in 4:41:15. Another new member Gerard Sheehan came home next in 4:51:41. Apologies if anybody was missed, getting the correct information was a little difficult with some of the number changes. If there are corrections please let us know. The Athletics Ireland National Championship team results have not been completed yet but provisionally it looks like our senior women’s team of Adrianna Melia, Niamh Kiernan and Ann Brady just missed out on the bronze medal by a few minutes. Their combined time will probably place them in 4th or 5th team position from what will probably be 100’s of women’s teams. In fact this year’s team race was extremely competitive and their time would have seen them medal over the last number of years. Quite a performance for a small club in an extremely competitive competition. Something to aim for next year. Congratulations to Gary O’Hanlon who finished second in the National Championships. 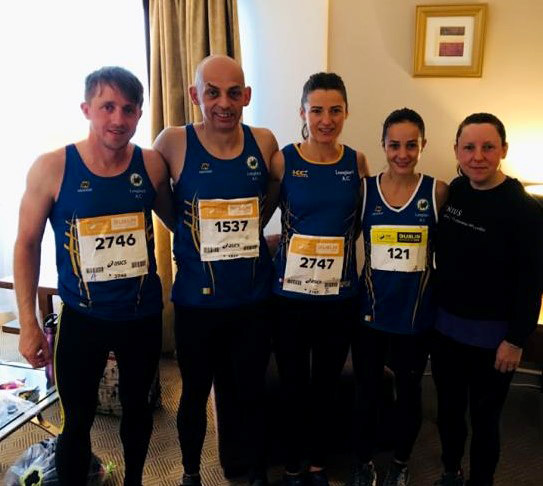 Gary coaches a number of Longford AC members and has Longford connections with his partner Paula Moran coming from Edgeworthstown. Congratulations to all our members on not only completing the considerable challenge of running 26.2 miles but also on achieving you own goals and producing many fine performances. Longford AC is a small club and nearly all the current registered senior members ran in this year’s Dublin Marathon. There were many more Longfordians running in Dublin and Longford AC would be delighted to see these runners register with us in the future and run races under the Longford AC banner.